Ted hose are very useful stockings that help prevent blood clots in patients' legs, especially if they are on bedrest or recently had surgery. They are often used in conjunction with a sequential compression device or SCDs. If your patient's doctor recommends them, don't hesitate, put them on. So how are they different from other stockings? They are made of very durable elastic fibers that, unlike regular stockings, do not rip or tear easily. Because of this, they fit much tighter in order to promote healthy blood flow for each leg. First, you have to decide how far up the leg the ted hose needs to go. Does your patient need them to reach just up to bottom of their knees, which would be knee length? Or do they need them to go all the way up to their thighs, which would be thigh length? There are also three different length options which is determined by measuring the length of the leg. Although it is a very simple process, it can be difficult to put ted hose on your patient simply because they have to fit so tightly. I have actually broken out into a sweat putting them on before. You also have to be extra careful if your patient recently had hip or knee surgery since you don't want to cause them unnecessary pain. How do you do this? First of all, hold the stocking at the top with both hands and start pulling the stocking up towards your hands until you reach the bottom of the stocking. It should look like a wrinkly doughnut. Then pull it apart as far as you can with both hands. It won't stretch very far, but every little bit helps with this next step. Place the stocking over the patient's toes and back all the way to the heel and stretch it as far up their leg as possible. You won't be able to pull it all the way up their leg the first time, but just go as far as you can. The next thing you do depends on how well you did the previous step. If it is wrinkled at the foot, take both hands and grip slightly above the wrinkle and pull towards the heel. If it is wrinkled above the foot, pull up towards the leg. Keep doing this until there are no more wrinkles. Then, off to the second leg. 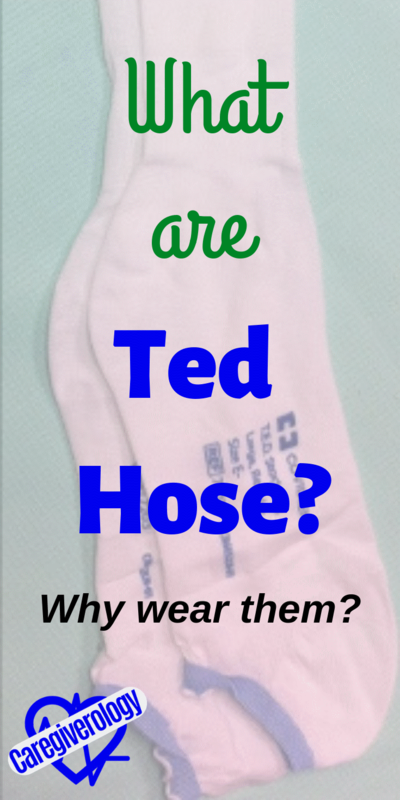 It's a lot easier to take ted hose off of your patient than it is to put them on. First, grab the top of the hose with both hands, stretch it apart as far as you can, and pull down all the way to the toes. It should be completely inside-out once you are done. It's that simple. You should not permanently take them off until your patient is very much ambulatory and their doctor approves of removing them. Of course you can take them off for short periods of time such as needing to change them because they are dirty, checking for circulation, or to wash their legs when giving a bed bath. The "ted" in ted hose is actually an acronym that stands for Thrombo Embolic Deterrent. The hole in the foot part of the stocking is there so you can easily check for circulation without taking it off. The plastic packaging they come in are often placed over the toes and part of the foot before putting the stocking on. This makes them slip on more easily.